In a television appearance, Labor MK Shelly Yechimovich says she "won't rule out" forming a coalition with Netanyahu or Liberman. In paradoxical television statements Sunday, MK Shelly Yechimovich (Labor) criticized Prime Minister Binyamin Netanyahu for his obsession with power, while also stating she would not rule out forming a government with him and Likud. On Thursday, Netanyahu said that the Likud would not sit in a coalition with the joint list of Yitzhak Herzog's Labor and Tzipi Livni's Hatnua. "The Labor Party has chosen a radically left and anti-Zionist list," he said in a statement. "There is a yawning gap between Labor and the Likud." 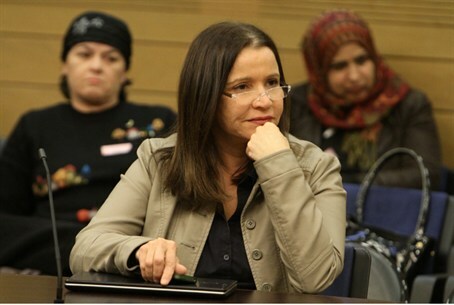 Livni followed suit on Friday, claiming Labor would never join a government with Likud because, according to her, Netanyahu refuses to heed the beck and call of United States President Barack Obama. "Unity is not a technical matter of distribution of files, but a matter of a shared vision," Livni told Army Radio. "Netanyahu and [Jewish Home Chairman Naftali] Bennett's plan is a way that leads to the deterioration of the state of Israel in any field - you should understand who they are and what their blocs stand for in this election - we have here one bloc that includes the far-right Likud and Bennett, and it is very clear that their way is not our way." Yechimovich, who placed third on the joint list - behind Herzog and Livni - is apparently taking a different perspective. In an appearance on the Orly and Guy program, Yechimovich said, "I would rule out almost no one as a coalition partner in Herzog's government - including Likud and Liberman's party [Yisrael Beytenu]." "But," she continued, "as long as Netanyahu is Prime Minister, everything will be done his way." "We see this over and over; when he is Prime Minister - we are all his contractors. I believe that the Labor Party should not be a contractor," Yechimovich added. The former Labor leader also noted that she did not believe Netanyahu would be able to form the next government, even in the event his party received the majority of votes. "This entire discussion is completely imaginary to me, because the person who will be tasked with forming the next government is Yitzhak Herzog - who is, as of today, much more likely than Netanyahu to do it," Yechimovich claimed. "That's where we're going - Yitzhak Herzog as the head of the next government and the one to form it."